Intense water damage is something that no one, no matter who you are, wants to go through. If your home has experienced water damage, getting the right company to take care of the job quickly is essential. Paul Davis Restoration is that company and we are ready to respond to your emergency at any time. Since the inception of our company, cleaning up and restoring water damage has been one of our core services. 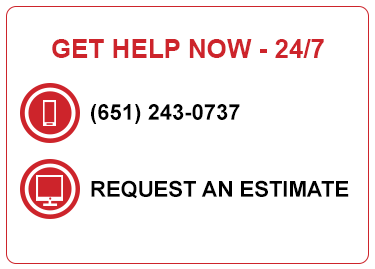 Please let us know if you require immediate assistance by giving us a call at any time or clicking on the “24-hour Emergency Services” button on this page. We’ll get back to you within 30 minutes and can be at your property within four hours. When a structure has been affected by water damage, there are specialized equipment and scientific methods needed to dry the area completely. Water can quickly creep into the subfloor and “wick-up” into walls and drywall, which can only be seen by moisture meters and infrared cameras. You can avoid costly future repairs by choosing an experienced restoration company to handle situations like this. Learn what to do before we arrive and get helpful information and tips about water damage here*. You will need more than just a vacuum and a fan to take care of drying an area that has been damaged by water. Get back into your home as quickly as possible by contacting the restoration staff at Paul Davis in Eagan, MN.